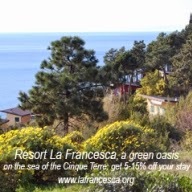 La Francesca is situated in a protected area, 15 hectares close to the National Park of the Cinque Terre. The microclimatic features of La Francesca are due to its favourable position facing South and protected from the North winds. Medium temperatures, during the coldest months, seldom fall below 10° and weather is dry and sunny for most of the year. Rains, sometimes violent, sharpen underwoodʼs perfumes, while in Winter citrus fruits grow ripe and roses come out with no risk of frosts. Walking through the shaded footpaths of the Village, from the belvedere to the orchard, from the restaurant down to the sea, one feels part of a protected natural landscape. Tourists, who nowadays are more and more desirous to find unspoilt places, find in La Francesca the ideal place for a stay in all seasons. There, they can go through old tracks and discover landscapes, scents and natural flavours.